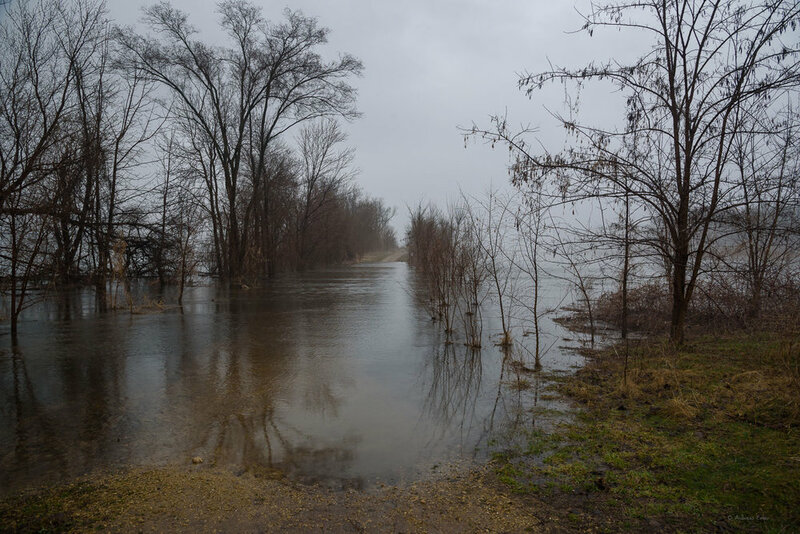 The Mississippi River is flooding and many places I visit frequently around Dubuque, Iowa are not accessible at the moment. I went out twice today in different weather conditions. Here are some photos. The park with boat ramp, campsite, and recreation areas was completely under water. The water reached the railroad tracks and I guess the park ranger had to drive through to reach his residence in the park. It rained and the fog didn’t even allow to see the main channel of the river. I have never seen the access to the trail under water. However, some ducks and geese didn’t mind it at all. The dyke leads into the marsh and finally to the main channel of the Mississippi. Same place, just five hours later. 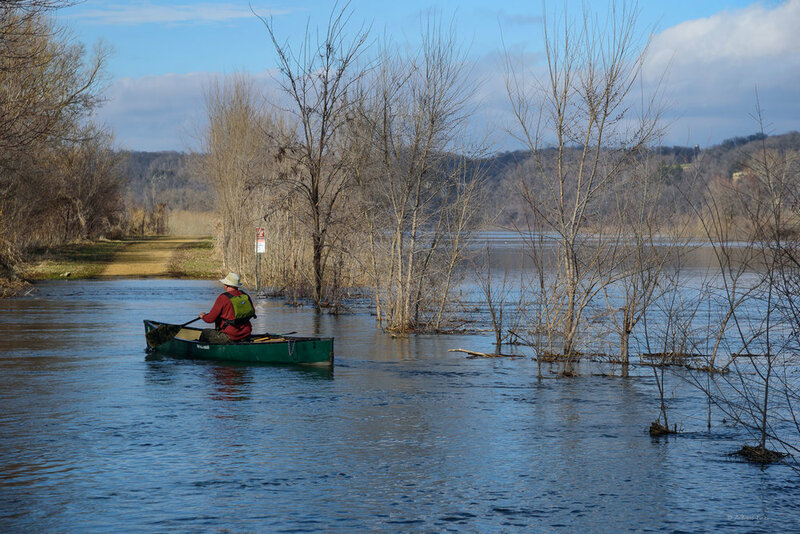 The rain and clouds went away, the sun came out and this gentleman made the best out of the situation and launched his canoe on the trail. The current was pretty strong, although the main channel is almost 1,000 meters away from this point. 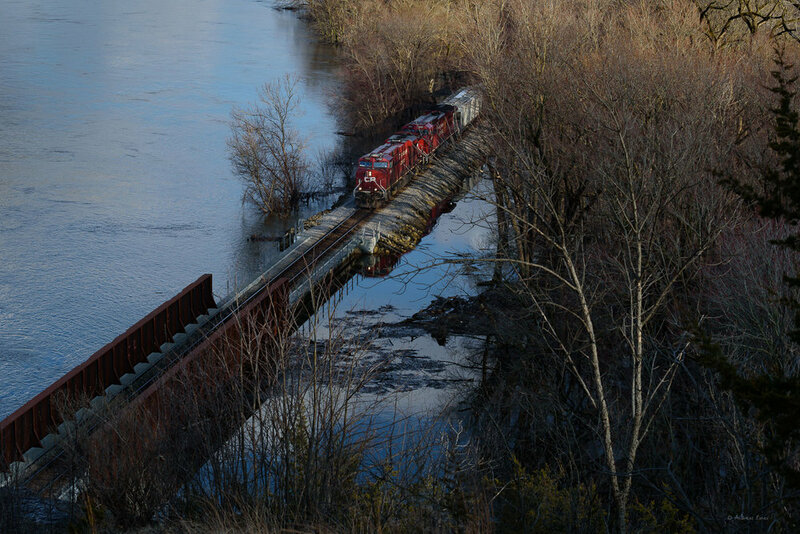 A freight train approaches the bridge that crosses Catfish Creek. At the bridge little Catfish Creek meets the mighty Mississippi. The high water pushed into the side valleys and flooded much of the lower parts of the valley.